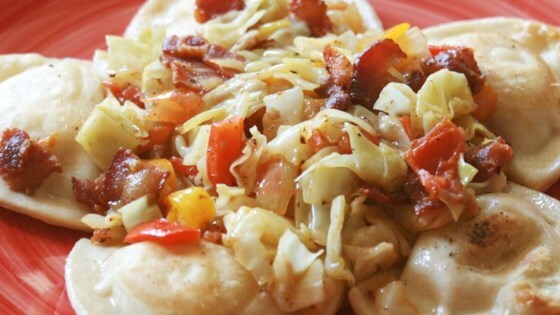 "A filling and delicious meal of tangy cabbage with potato and cheese filled pierogies. Serve with a tossed green salad, if desired." Place bacon in a large, deep skillet. Cook over medium high heat until evenly brown. Drain, reserving drippings, and set aside. Heat bacon drippings over medium heat and stir in cabbage and onion; cover and cook for 10 minutes. Stir in tomatoes, vegetable oil, vinegar, sugar, salt and bacon; cook uncovered for 5 minutes. Meanwhile, prepare pierogies according to package directions; drain. Combine pierogies with cabbage mixture and serve. The cabbage to pierogies ratio was a little off for me. I also thought the cabbage mixture was a little too tart. I won't make this again. Great, but skipped the bacon and used canola oil to make it veggie. This was great. I used smoked sausage instead of bacon as suggested by another user. I was not very fond of pierogies before this recipe! Thanks!